The first thought that comes to mind when taking a step back to look at the Geiger F650 is that this mechanical monstrosity is gonna be mighty thirsty for fuel. While it may not be powered by mere petrol, keep in mind that in most places diesel fuel actually costs more nowadays. Sure, you get over 737 lb-ft of torque from the 6.7-liter inline-six Cummins, but you really do need it to move this beast of burly burden. Here's the thing, we've seen vehicles like this sort of 6/4 scale pick-em'-up truck plenty of times before. Remember the ridiculous Alton? 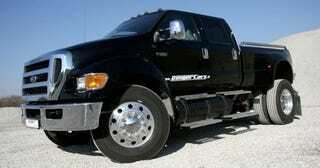 Or this F-650 from SEMA? Or how about this piece of overcompensation? Then there's the rigs from International. And don't even get us started on our buddy Ironhide, the GMC TopKick. We're just trying to point out that maybe the German turners at Geiger didn't exactly have the timing right on bringing this to the market.